Windshield de-icer, Vehicle stability control (VSC), Variable intermittent windshield wipers w/mist cycle, Variable gear pwr rack & pinion steering, Traction control (TRAC), Tire pressure monitor system, Smart stop technology (SST), Skid plates -inc: engine, fuel tank, transfer case, Side-impact door beams, Rear window defogger w/timer. 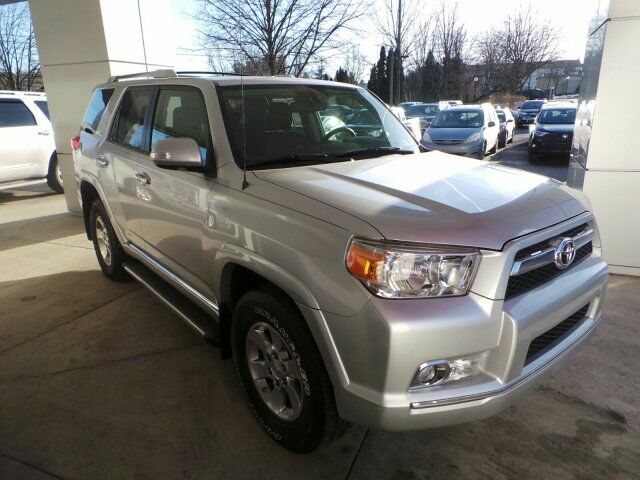 This Toyota 4Runner has a strong Gas V6 4.0L/241 engine powering this Automatic transmission. Rear privacy glass, Rear HVAC vents, Rear child-protector door locks & pwr window lockout, Pwr windows w/auto up/down, Pwr window in rear liftgate w/auto up/down, Pwr 4-wheel ventilated disc brakes, Programmable pwr door locks, Multi-information display -inc: clock, fuel consumption, cruise range, temp, compass, Lower anchors & tethers for children (LATCH) in 2nd row outboard seating positions, Integrated tow hitch receiver -inc: wiring harness w/4-pin & 7-pin connectors, Independent double wishbone front suspension w/coil springs, HomeLink universal garage door opener, Hill start assist control (HAC), Hidden rear intermittent wiper, Front & rear stabilizer bars, Foot pedal parking brake, Fog lights, Electronic brakeforce distribution (EBD), Dual illuminated visor vanity mirrors, Driver & front passenger seat-mounted side airbags. Carfax reports: No Damage Reported, No Accidents Reported, 19 Service Records.